Patanjali has as many as 21 private limited companies and 26 partnership firms listed under ‘disclosures of transactions between related parties’ where it has a controlling stake. Some subsidiaries were not initially incorporated by PAL but became one through acquisition — through a multi-layered transaction. Several of these affiliates are neither related to the Patanjali Group nor associated with the principal business activities of the group companies. Pandav Nagar is one of the several hundred residential colonies in Delhi. It is a bustling locality where offices and shops jostle for space with houses. The offices belong to modest businesses in real estate, furniture and electronics, among others. It is an odd place to find the registered office of a unit of an Indian consumer products company that has rapidly grown into a multi-million dollar business. Yet, the area is home to Verve Corporation — a subsidiary controlled by Patanjali Ayurved Ltd (PAL), co-founded by yoga guru and entrepreneur Baba Ramdev. The fancy title is not the only unusual bond between Verve and PAL, which aggressively publicises that its products and culture are rooted in Indian tradition. PAL has built its success on a blitz of publicity to sell its products. Posters, billboards and commercials of its brands abound. Verve is shorn of this spotlight. Even a signboard outside the office, which it shares with at least seven more companies, is absent. Verve is part of a byzantine collection of subsidiaries that PAL has invested nearly Rs 325 crore in recent years. PAL has as many as 21 private limited companies and 26 partnership firms listed under ‘disclosures of transactions between related parties’ in which it has a controlling stake, according to a review by CNBCTV18.com of hundreds of documents and regulatory filings by the company. Many of these entities have three things in common (see Patanjali’s Investments in Subsidiaries and Patanjali’s Investments in Partnership Firms). One, they have no commercial operations. The only income they earn is through interest on funds parked in banks or any other financial instrument. Two, they have been incorporated through a maze of transactions. Three, they underwent at least one name change. In fact, there are only four subsidiaries of PAL that have operations, company records show. To be sure, there is nothing unusual in investing in subsidiaries. It is routine for companies to make investments in subsidiaries and other affiliated firms. This practice is actually standard for several Indian companies. But investments in businesses with zero operations and at a premium at that is another matter. 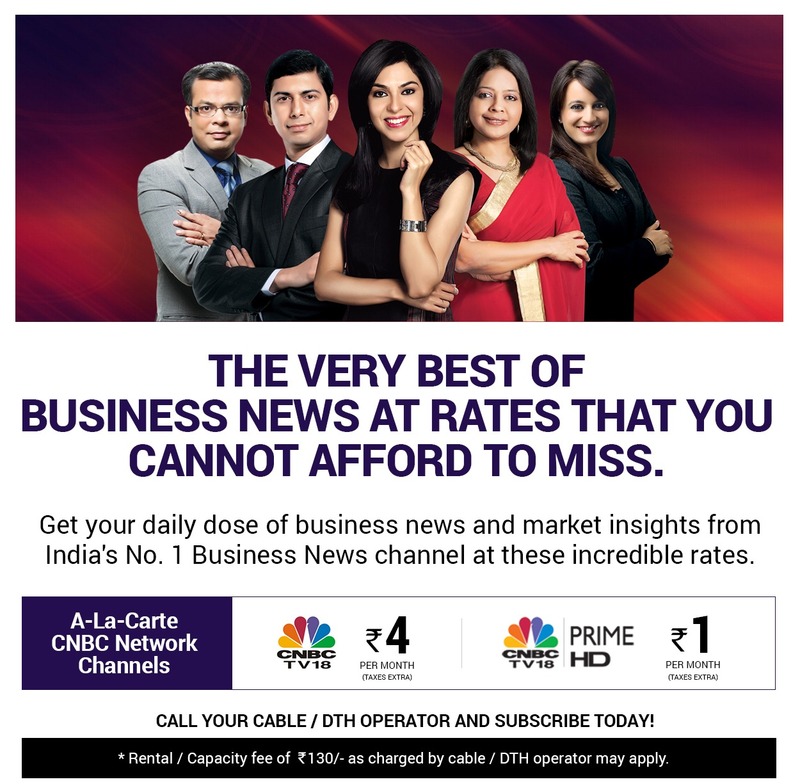 PAL did not respond to a detailed questionnaire that CNBCTV18.com sent on Monday on the rationale behind the investments and the role of individuals, including a Scotland-based NRI couple, connected to subsidiaries, among others. A lawyer at one of India’s biggest legal firms said paying high premiums for scattered investments of this magnitude with low yields is very peculiar, adding that the underlying business principle for such investments is incomprehensible. He spoke on the condition that neither his firm nor he was named. Vijay Sambamurthi, founder and managing partner at Lexygen, a law firm, said historically there has been no bar at a price which one can subscribe to shares of a company but in recent times, there have been cases of the routing of money through shell companies and the government has introduced provisions in the New Companies Act, 2013 and the Income Tax Act. “If an investment is made in a company which has no value or a very little commercial value and the shares have been issued at a huge price, then tax can be levied on it,” he said. Some subsidiaries were not initially incorporated by PAL but became one through acquisition — through a multi-layered transaction. Several of these affiliates are neither related to the Patanjali Group nor associated with the principal business activities of the group companies. The investments in these entities range from Rs 65.6 crore to a couple of lakhs of rupees. Patanjali is a cash-rich company. It posted a revenue of around Rs 9,187 crore and a net profit of around Rs 1,194 crore in 2016-17, according to the latest earnings it declared. 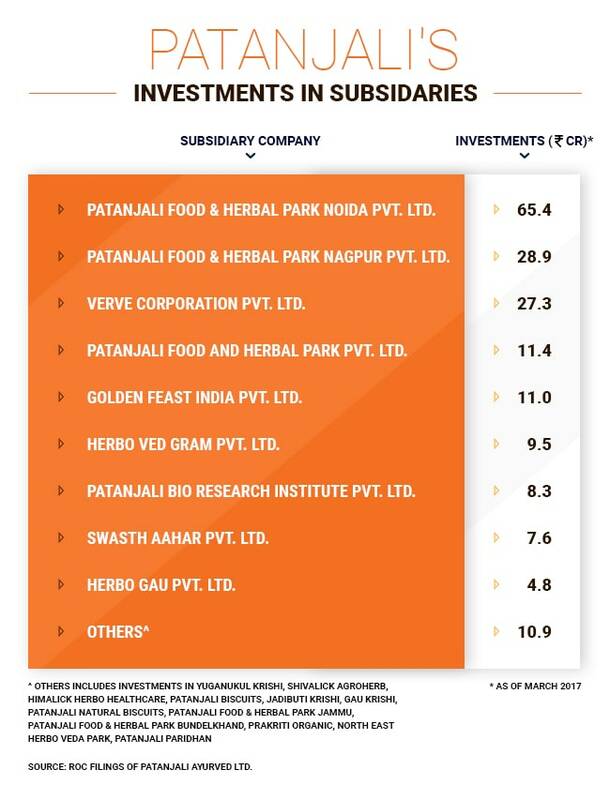 Below is a deep look at some of the subsidiaries in which PAL has made significant investments and the intertwined connections with a group of individuals, including a confidant of Ramdev. PAL has invested in Verve Corporation Pvt Ltd, listed as a subsidiary company, according to Registrar of Companies (RoC) filings. Incorporated as a private limited company in 2010 — it was initially named Verve Building Solutions before it was rechristened — it states ‘real estate’ as the principal business activity. Verve was not incorporated by Patanjali or any director affiliated with the group. 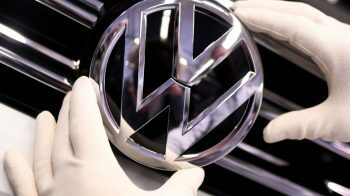 The company had two persons named Ashutosh Kumar Pandey and Mahesh Agarwal as initial shareholders. Two others named Kishan Veer Sharma and Saroj Sharma took over the company within a few months of its inception. The name change happened soon after, but Verve became a PAL subsidiary only in 2015. Kishan Veer Sharma, the key managerial personnel in Verve Corporation, is also a director in most of the other affiliates of PAL. 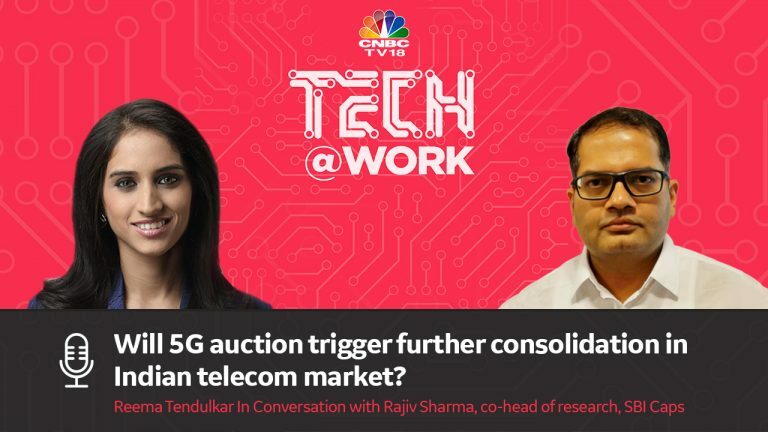 Sharma told CNBCTV18.com by phone that he is not aware of any investment by PAL in Verve though he confirmed his association with Patanjali and appointment on the board of several companies, including Verve. 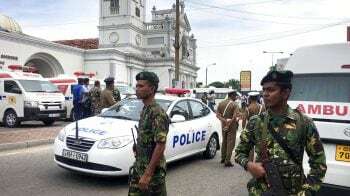 He said he resides in the registered address of Verve mentioned in the filing, but could not explain the company's commercial activities or confirm the number and names of companies where he is named as a director. 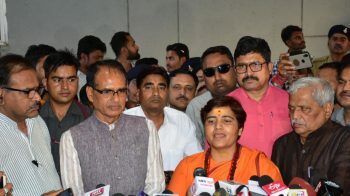 It is unclear how the other individuals are connected to PAL or Ramdev. PAL did not comment on its ties with these individuals. There are mainly two ways in which a company can become a subsidiary of another. One, a company can create a subsidiary by owing 100 percent or majority of shares of a newly incorporated entity. Two, a company can acquire all, or a majority stake, in an existing company. Verve came into the fold of PAL through the second route. In November 2015, PAL invested Rs 27 crore in Verve for 98.94 percent of the company. The remaining shares were owned by Kishan Vir Sharma and Saroj Sharma until April 2016. PAL bought the remaining stake from them for Rs 29 lakh. 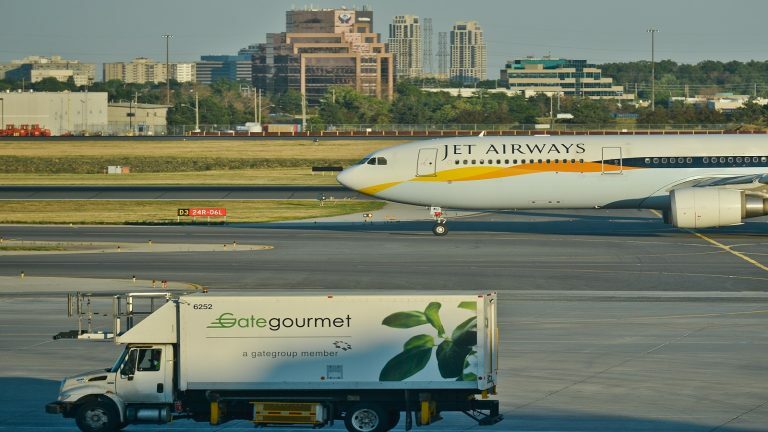 PAL acquired these shares at a premium of Rs 279 per share even though Verve has neither fixed assets nor commercial operations, reveal the RoC filings. PAL’s investment in a real estate firm with no operations, that too at a considerable premium, is conspicuous given its existing businesses. Golden Feast Pvt Ltd is another company that became a PAL subsidiary through acquisition. The company was incorporated in 2004 with Ram Dhan Singh and Ashish Aggarwal as initial shareholders. The two resigned as directors in April 2011. In Aug 2011, Sunita Poddar, a Scotland-based non-resident Indian (NRI), invested Rs 8.5 crore in the company along with Gorakhpur-based Rajendra Kumar Agarwal and Bhopal-based Acharya Ganeshji. These individuals pumped Rs 1 lakh and Rs 10,000, respectively. Poddar was a shareholder in PAL between 2009 and 2015. Soon after the capital infusion, Golden Feast invested Rs 8.51 crore in Patanjali Food and Herbal Park Pvt Ltd, another PAL offshoot, company records show. In the next few years, Sunita Poddar increased her investment in Golden Feast to Rs. 8.9 crore. In July 2013, Golden Feast also gave a bank guarantee for Patanjali Food and Herbal Park Pvt Ltd for a Rs 22-crore loan from State Bank of India. Golden Feast was neither a Patanjali subsidiary nor an associate company at that time. The amount of the guarantee is not clear in the RoC filings. PAL did not respond to the queries when asked for details of the transaction. Two years later, PAL purchased 66.67 lakh shares of Golden Feast through a three-tier share transfer transaction, and Acharya Balkrishna, the co-founder of PAL and a confidant of Ramdev, bought 22.32 lakh shares in the company. In 2015-16, Sunita Poddar transferred her entire shareholding of 88.9 lakh shares in the company to her husband, Sarwan Poddar. He further passed the stake onto PAL and Balkrishna. The other two shareholders — Rajendra Kumar Agarwal and Acharya Ganeshji — also transferred their entire stake to PAL and Balkrishna. According to the RoC filings of PAL, it purchased shares at a price of Rs 16.3 per share and invested around Rs 11 crore in the company. This was again done a premium of Rs 6.3 apiece for a company with no commercial operations. Also, going by this number, the Poddar couple is estimated to have made Rs 14.5 crore against the initial investment of Rs 8.9 crore, a 1.6x return over four years. It is not the only instance of the Poddars exiting a Patanjali group company. Their exit from Golden Feast also coincides with their departure from PAL as well, again through a layered transaction. The Poddars’ association with PAL as shareholders can be traced back to at least 2007. The couple provided the initial capital required for PAL’s expansion. Sunita Poddar hit the headlines for donating an island in Scotland to Ramdev. 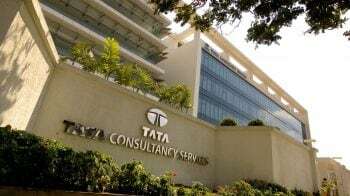 The couple invested around Rs 3 crore between May 2007 and November 2008 in buying shares in the company, according to PAL’s filings with the RoC. In May 2007, PAL allotted 1 lakh equity shares to Sarwan Poddar. Poddar was given 5 lakh more shares in August 2007. 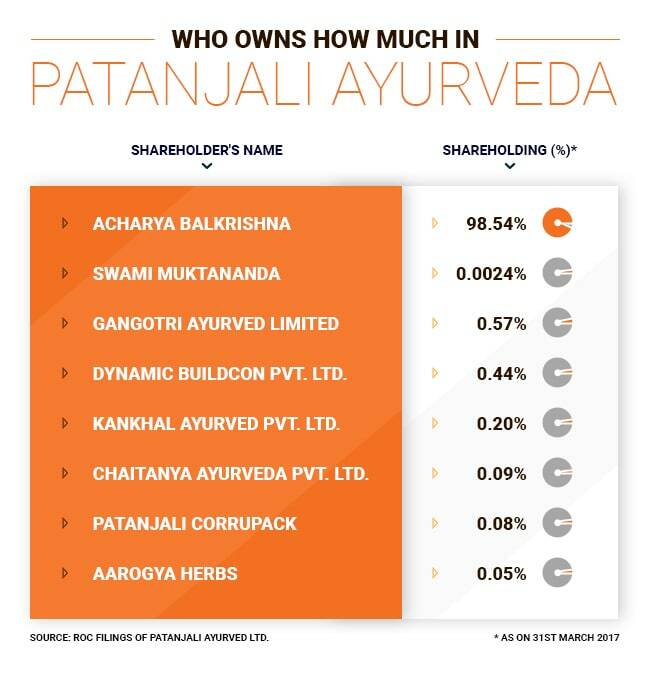 As of March 2008, Sarwan Poddar became the second-largest shareholder in Patanjali with a 4 percent stake while Balkrishna owned 94.62 percent. 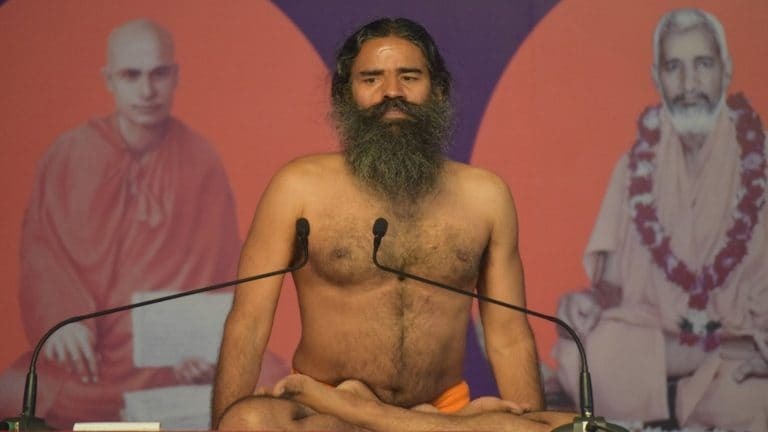 The couple remained the company’s second-largest shareholders until January 2015, when they started offloading their shares and transferred their entire stake to Balkrishna and entities controlled by him (see Who Owns How Much in Patanjali Ayurveda). Such exits are usually routine. But the share transfers in the case of Poddars were complex because they were routed through other individuals. According to the company’s filings with the RoC, in January 2015, Sunita Poddar transferred almost her entire stake to her husband as a “gift”. She was left with only two shares of her own. In March 2015, Sarwan transferred 12.52 lakh shares, again as a “gift”, to their son Deepak. The very same day, Deepak transferred the gifted shares to Balkrishna (1.44 lakh shares),’s brother Ram Bharat (5.96 lakh shares), Gangotri Ayurveda Ltd (2.37 lakh shares), Kankhal Ayurveda Pvt Ltd (84,032 shares), Chaitanya Ayurveda Ltd (39,854 shares), Sneh Bharat (11,290 shares), Dynamic Buildcon Pvt. Ltd (83,870 shares), Patanjali Corrupack Pvt Ltd (33,119 shares) and Aarogya Herbs (India) Pvt Ltd (22,580 shares). Balkrishna is a majority shareholder in these companies. Post the transaction, these companies became part-owners in PAL. There was more to come. In September 2015, Sarwan Poddar gifted 10 lakh shares to his daughter-in-law Adithi and the remaining 2.36 lakh shares to Patanjali Yoga Peeth (UK) Trust. The Trust was registered as a UK charity in 2006 and has Sunita Poddar on the board of trustees, according to its website. In March 2016, the trust and Adithi passed on the gifted shares to Balkrishna. The same day, Sunita Poddar also transferred her remaining two shares to him. It is not clear if these transactions were just a transfer of shares on paper and whether the Poddars earned any monetary benefit out of it. The value of these share transactions was not mentioned in RoC filings. The RoC filings of Gangotri Ayurved Ltd, Kankhal Ayurved Pvt Ltd and Patanjali Corrupack Pvt Ltd, to which Deepak transferred shares, reveal that the value of their stake in PAL at Rs 155 apiece. Going by this share price, the stake transferred by the Poddar couple is estimated to be around Rs 40 crore, a 13x return, accounting for the Rs 3 crore at a face value of Rs 10 apiece that they initially invested in PAL. 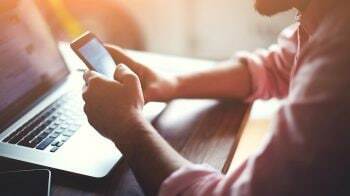 As for NRIs transferring shares to an Indian resident or a company registered in India, it may require filings to be made to the authorised dealer under FEMA, with information of the price at which shares are being transferred, according to him. “It can be questioned why two transactions took place back to back on the same day. 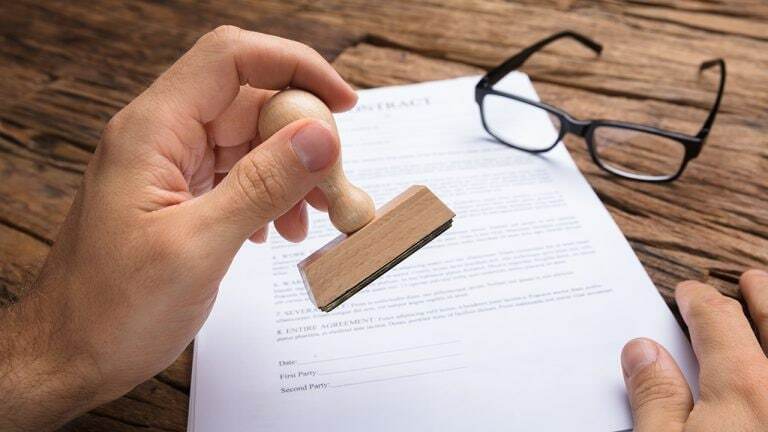 Sometimes companies structure transactions in a certain way for the general business purpose also, but one would have to look at the background and see if there is any merit in their explanation,” Sambamurthi explained. The Poddars also run a company named Oakminster Healthcare Ltd, based in Glasgow. Sunita is the company’s managing director. Her Linkedin profile shows that she is also the CEO of Vedic Broadcasting Inc, a trustee of Patanjali Yog Peeth (UK) Trust and a member of the board of governors of Patanjali University. Vedic Broadcasting Inc has the distribution rights for the Indian religious TV channel Aastha. The channel is operated by Vedic Broadcasting Ltd, which has Balkrishna as managing director. PAL had no comment on this share transfer deal and the role of Poddars in Patanjali group. The Poddars too did not comment for this article. PAL has also invested in other offshoots such as Herboved Gram Pvt Ltd (Rs 9.5 crore), Yuganukul Krishi Pvt Ltd (Rs 2.4 crore), Herbo Gau Pvt Ltd (Rs. 4.8 crore), Shivalick Agroherbs Pvt Ltd (Rs 2.2 crore) and Himalick Herbo Healthcare Pvt Ltd (Rs 2 crore). Unlike Verve Corporation and Golden Feast, these firms were initially incorporated by directors of PAL, and Balkrishna owns a majority stake in these subsidiaries as well since incorporation. For instance, Herboved Gram Pvt Ltd was incorporated as Patanjali Daily Needs Pvt Ltd in August 2009 with Balkrishna and Ram Bharat as initial shareholders in the company. In April 2011, the name of the company was changed to Herbo Gram Ved Pvt Ltd. It also changed the principal business activity to setting up of yoga centres and manufacturing of Ayurvedic, herbal healthcare products. In May 2014, PAL invested Rs 9.5 crore in the company at par. 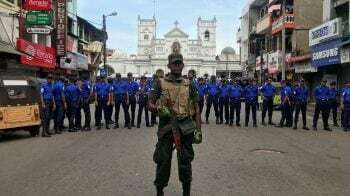 The company is yet to start commercial operations. A similar pattern surfaces in Shivalick Agroherbs and Himalick Herbo Healthcare. Both the companies were floated by Balkrishna and Ram Bharat. Shivalick Agroherbs was incorporated as Patanjali Aahar Pvt Ltd, and Himalick Herbo Healthcare as Patanjali Telam Pvt Ltd in August 2009. The names were changed in April 2011. PAL invested Rs 2.2 crore and Rs 2 crore in Shivalick Agroherb in April 2013 and Himalick Herbo Healthcare in February 2017, respectively. Both the companies have no commercial operations to date. Yuganukul Krishi Pvt Ltd is the only company among the ones mentioned above that became a subsidiary of PAL through a direct route. The company was floated by PAL itself in September 2015. PAL has so far invested Rs 2.24 crore in the company, but it is yet to start commercial operations. The memorandum of association of Yuganukul Krishi states acquiring, utilising, growing, planting, cultivating, producing and to exploit any estates or lands for floricultural, agricultural, horticultural, sericultural and farming purposes and agro projects. Managing cow shelters — ‘Gaushalas’ with modern and Indian-ancient systems and to do the business of produces from Gaushalas — is its primary object of business. PAL has also invested in Patanjali Food and Herbal Park Pvt Ltd. The company is one of the four subsidiaries of PAL that launched commercial operations. Incorporated in December 2009, Patanjali Food and Herbal Park runs an enterprise by same name in Haridwar. PAL has so far invested Rs 11 crore in the company. PAL directly holds 73.65 percent in the company and 5.56 percent through Golden Feast. The other companies with operations are Patanjali Bio Research Institute Pvt Ltd, in which PAL has so far invested Rs 8.32 crore as of March 2017, Swasth Aahar Pvt Ltd and Patanjali Biscuits Pvt Ltd.
PAL also invested a large chunk of money in the two food parks that the company is developing. PAL invested Rs 29 crore in September 2016 in Patanjali Food and Herbal Park Nagpur and Rs 65 crore in Patanjali Food and Herbal Park Noida as of March 2017. PAL has invested around Rs 143 crore in 26 partnership firms as of March 2017. For instance, PAL pumped around Rs 26 crore in Prakriti Herbs Co, Rs 16.5 crore in Bhoomi Enterprises, Rs 16 crore in JS & Company and Rs.13 crore in Sethi and Company, among others. 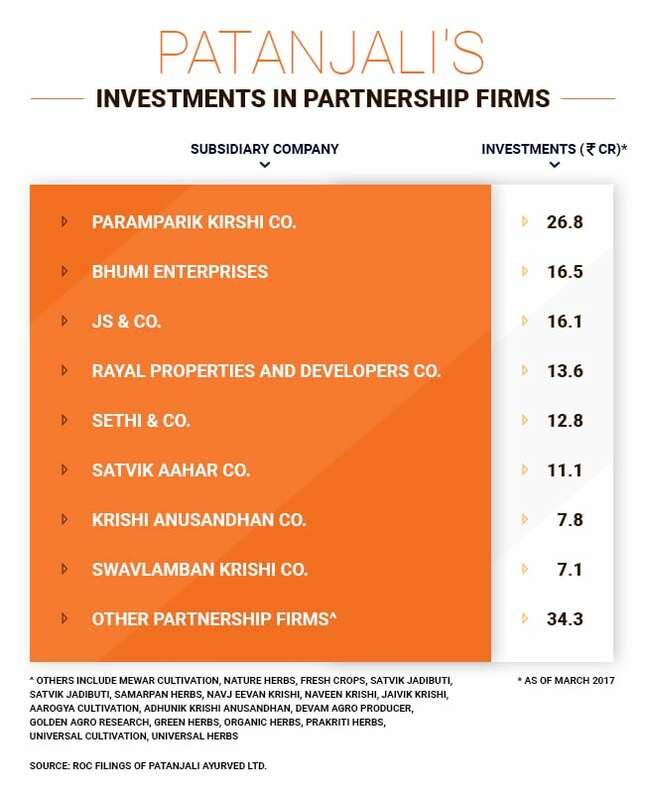 Since these firms are registered under the Partnership Act and are not required to submit regulatory filings with RoC, CNBCTV18.com could not analyse these investments any further. PAL did not comment on these investments too. Gangotri Ayurveda, which owns 0.57 percent in PAL after the transfer of shares from Deepak Poddar, recently received a fresh capital infusion in the company by Balkrishna and Ram Bharat. They together invested around Rs 20 crore in January 2018 at a share premium of Rs 671.04 per share for a company with no economic activity. Balkrishna owns 97.32 percent of Gangotri Ayurveda. The rest is owned by Ram Bharat, Swami Muktananda and four other shareholders as of March 2017. In 2011-12, Kankhal Ayurved Pvt Ltd, another part owner of PAL, in which Balkrishna is the majority shareholder, extended a loan of Rs 1 crore to an entity named Guna Airline Pvt Ltd. Kankhal Ayurved is not the only PAL affiliate to invest in Guna Airlines. Even Rohini Infracon, an associate company of PAL, in which Acharya Balkrishna owns 92 percent, paid Rs 2 crore to Guna Airline Pvt Ltd. The investment is shown as an advance against land, according to the RoC filings. There is no entity with such a name registered in India. Nepal-based Guna Airline pops up on Google but it is unclear if it is the same Nepalese airline. Guna and PAL did not comment.